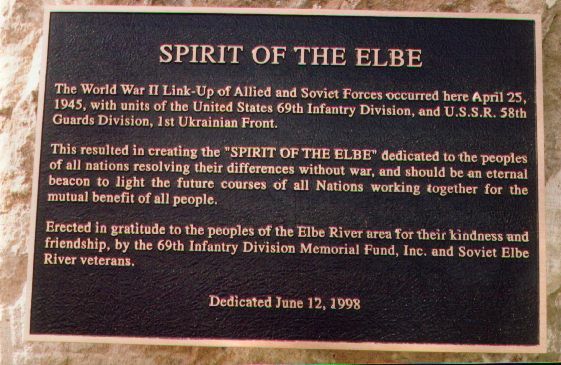 Torgau, Germany, on the banks of the Elbe River, was the scene of the historic "East Meets West" link-up of the American Fighting 69th Infantry Division, and the Russian 58th Guards, April 25, 1945 (see "East Meets West" Link). To commemorate this event for posterity, two members of the Fighting 69th Infantry Division, Edgar R. "Bud" Parsons, Company A 272nd Infantry Regiment and Dillard Powell, Anti-Tank Company 271st Infantry Regiment, proposed between themselves that a Torgau memorial should be built. Later, William R. "Bill" Beswick and William E. "Bill" Snidow, both of Company B 661st Tank Destroyer Battalion, joined with them in their efforts. Across the Atlantic, Heinz Richter of Kathewitz ( near Torgau), and Karl-Heinz Lange and Herbert Schedina, both of Torgau, gave much valuable assistance so this project could become a reality. 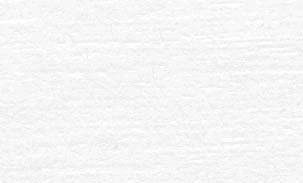 The majority of funds needed were contributed by members of the Fighting 69th Infantry Divison Association, Inc. 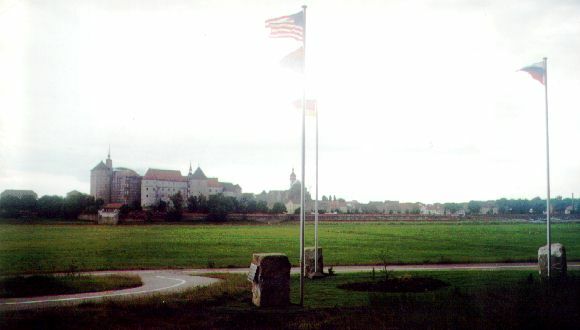 The City of Torgau, Germany, donated the land on the east side of the Elbe River away from the flood plain. Torgau landscaped the area and will maintain its beauty. 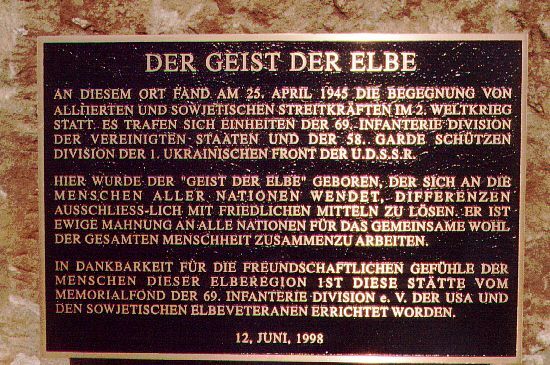 The "Torgau Memorial" was dedicated June 12, 1998, with members of the two Units and German officials and citizens present. 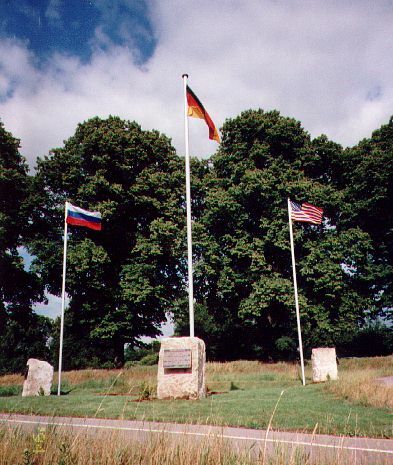 American, Russian and German flags mounted on sandstone blocks taken from the bridge across the Elbe where "East Meets West"- where American 69th Infantry Division member 2nd Lieutenant William D. "Bill" Robertson crawled out to meet Russian 58th Guards member Lieutenant Alexander Sylvashko and shook hands. 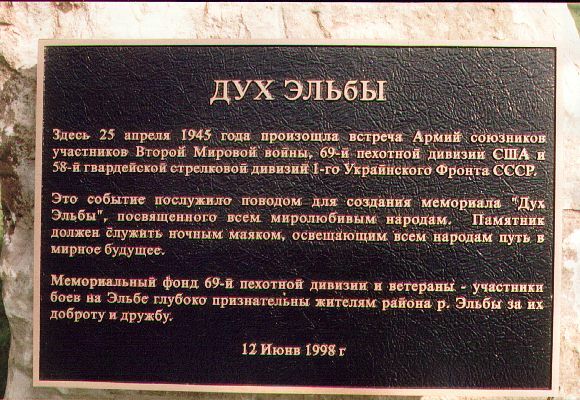 Each block bears a plaque of the same text in the country's language. German flag is in the forefront, Russian to its left and American to the right. Same as above but the historic Renaissance-style Hartenfels castle built 1533-44 is in the background. Sandstone block with English plaque. Sandstone block with Russian plaque.